The Hampton Inn and Suites on the Parkway features one bedroom suites with fully equipped kitchens, king bedded whirlpool suites, deluxe rooms with either king or 2 queen beds, as well as pet friendly rooms. There is an outdoor heated pool/hot tub, fitness room, business center and a complimentary Hot Breakfast Buffet featuring over 23 items. Each room includes hair dryers, iron/ironing boards, wireless internet, lap desks, 32″ LCD HD TVs and cable television with HBO and ESPN. 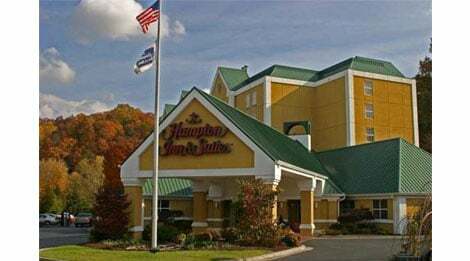 Hampton Inn and Suites on the Parkway is conveniently located at Traffic Light ?0?, which is directly across the street from the Hatfield & McCoy Dinner Show, WonderWorks and the Titanic Museum Attraction. Plus it’s only 10 minutes from Dollywood and two blocks from Five Oaks Tanger Outlet!